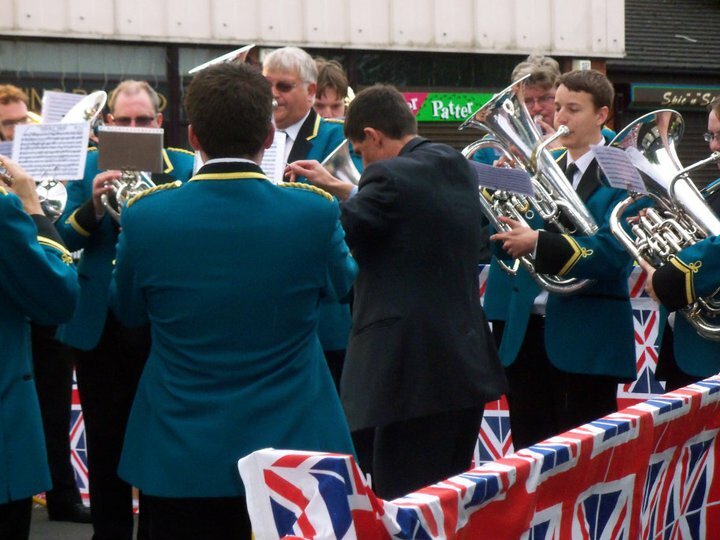 For many brass bands contesting is an integral part of their engagement calendar. This is where bands compete against one another to achieve the best performances of “Test Pieces”. In the early years these were arrangements from the opera or classical repertoires, but since the 1930s it is quite common for newly commissioned music to be selected. As in football, bands belong to a section (“league”) with others of a similar standard. To move up through the sections they must perform consistently well in contests. The top bands belong in the “premiership”, the Championship section. Our band is currently graded in the 1st Section. Contests happen in public and each band’s performance is graded by one or two adjudicators, who sit isolated from sight within a high sided enclosure to ensure their impartiality. They do not know the identity of the band they are listening to, only the band’s draw number. The tension on these occasions can be electric; however the musicianship is often very impressive. Contesting can put a considerable drain on band resources. It takes many hours of rehearsal to produce that musical performance. Nevertheless this investment is worthwhile in the end. Test pieces are designed to provide a musical challenge for every player, and this helps to drive up musical standards. In turn this should then translate into higher quality concert performances and increased satisfaction for everyone involved. We currently regularly compete in regional contests organized by Southern Counties Amateur Band Association. These are “own choice” contests, where the choice of test piece is entirely left to the competing band, and take place in the spring and autumn. As well as this, we compete in the National Brass Band Championships of Great Britain. This is the regional final for London & Home Counties and is held in March each year. As the only grading competition in the year, this contest determines our position in our section, if we are promoted or demoted.